Nominations are open through May 3 for Vice President, Treasurer and WEF Director. 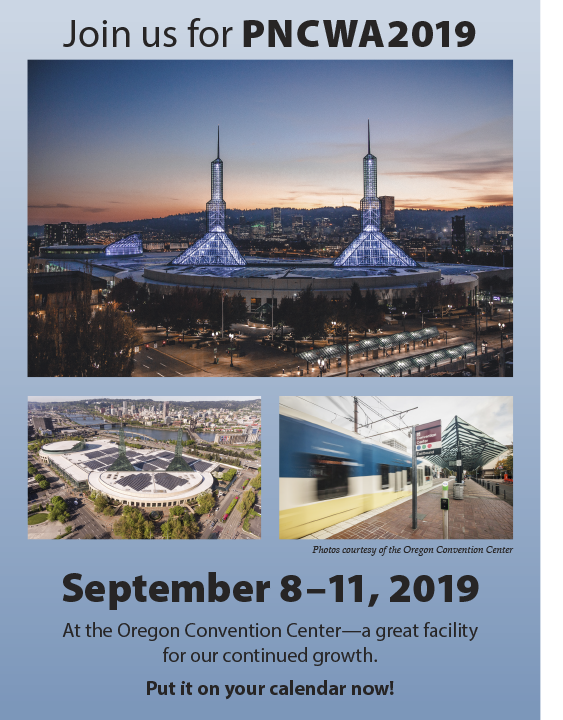 From the Conference Newsfeed: Sponsors and Exhibitors Save these Dates for PNCWA2019! New this year: Exhibitors will need to purchase, through the convention center, electrical service for their booth if they require it. Please complete the survey by January 18, 2019. We will start pairing teams the end of January. Stay informed. Sign up for email—nonmembers welcome. Subscribe to receive PNCWA E-Mail, by using this link. You will automatically start receiving email announcements about upcoming events, deadlines and programs! We look forward to your involvement!